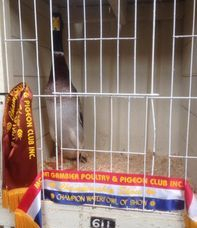 Mount Gambier Poultry & Pigeon Club Inc. The Mount Gambier Poultry Club was established in 1923. Some years later the Pigeon Club joined, to form the Mount Gambier Poultry and Pigeon Club. We hold 2 auctions and 2 shows each year which are well supported. We are heavily involved in the local A&S Society Show, club members also travel extensively throughout the state and interstate to exhibit their birds and to judge at other poultry shows.